It's actually about a month or two more but for the sake of generalisation and simple title, we'll stick with one year. This takes forever to finish because believe it or not, I'm busy. I started writing before Independence Day and well, we'll see when will it finally been published. I'll tell you guys properly later (as in God knows when later truly means) on why I am not a pharmacist yet. Please just believe me that I'm not doing this for fun. But for now, I'm gonna share what I did in all these time. About a month after finishing my study, a friend of mine told me about a substitute teacher opening. It is not under Jabatan Pendidikan Negeri (JPN) but was under Persatuan Ibu Bapa dan Guru (PIBG) instead. Apparently, even with the shortage of teachers, JPN just not hiring more substitute teachers. To cope with it, the PIBG gave some money for the school to hire independently. The salary is small (the teachers called it compensation instead of salary). I taught History to Form One student and Bahasa Malaysia to Form Two students. It was a really good expose for me befriending the teachers and the kids. I was really enjoying teaching too. However, it was quite a big challenge for me in being patient and coping with the more badly behaved kids. All and all, I'll do it all over again if I was given another chance at it. I was always a blogger and apart from the time constraint, the Malaysian blogging community was another reason why I didn't blog more seriously. You see, during my studies, I still do a little bit blogging but I didn't get involved with any other bloggers. It was hard blogging in English guys. More importantly, I regard writing as a beautiful skill and looks up to those who can write properly. It is quite hard to find these kinds of quality hence I didn't have many blogs that I truly enjoy and genuinely want to know more about the blogger behind it. All factors in, I wasn't a more avid blogger then than I am now. As I start to blog this time, I was so surprised to finally knowing lots of local quality blogs that I truly enjoyed (like the one in my blog list). The blogging community is just so precious for me right now. I hope I can write forever! Some of the quality blogs that I have grown to like have this Goodreads yearly challenge. It was a wild thing for me. I never met anyone so passionate and is so objective-minded in their reading. I do read, but not so much. This is also the time when I start to learn about book bloggers too. It gets me pumped up and I quickly make my own challenge. I only vouched for 25 books and now I am on my 11th book (kill me). 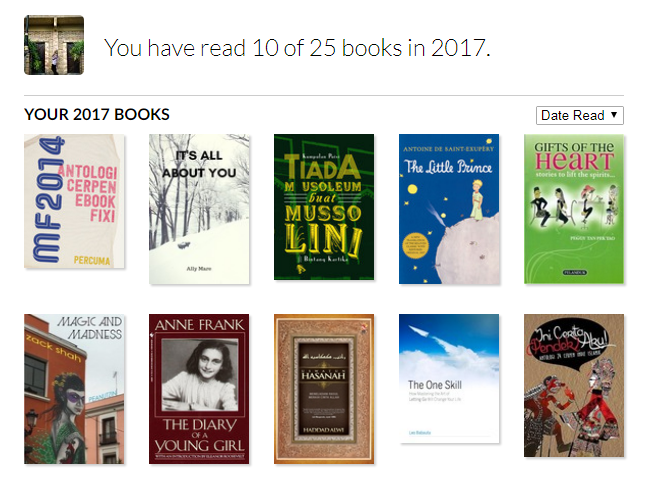 My progress was so slow because I want to read books that widen my views though my true favourite genre is fiction (English preferably). I also read three poetry books and oh my god, you guys don't have any idea how emotionally exhausted I am reading those. I hardly get more than five pages per sitting. The Uswatun Hasanah and Gifts of The Heart book were in my possession for years before I finally read it. On May the 22nd, I decided to use my Instagram account as a poetry account since I don't really post any pictures anyway. At the moment, I just post whenever I get an idea and it was quite childish in a way. The presentation is awful too. I was learning to understand the poetry community in Instagram which turns out to be more exciting than the one in Wordpress. It is easier too since everything is there. I started to join writing prompts and by 16th August I decided that my Instagram account gonna be an official poetry account. I do all things that I want to have in an official poetry account - a proper business profile account (that's why I need to make a facebook page lolz), a proper Instagram account name (@afifahwrites), a symbolic DP (black wings), becoming more interactive, proudly identifying myself as a poet and most importantly - to get more involved with the poetry community. This short experience has taught me lots of poetry writing and I actually set some goals for September. I even do cool feeds etc guys. This is my golden trophy. You guys can scroll down to be linked to my poetry account. By the way, this stuff took a lot of time. Since my mom passed away, I take the responsibility to cook whenever I'm home. Cooking is such a fun thing for me and to be able to cook a satisfying meal just makes everything worth it. If I feel like it, I even make some dessert guys. Sometimes I didn't let my other sisters cooked because I want it to be done my way. Apart from cooking, there are the regular laundry work and cleaning the house work and so on. I have plenty to do daily even without writing poems or updating my blog. The other stuff is those things that we have to do every once in while like going to our kampung to collect sawit money (my dad grew palm oils), heading everywhere since Muslim studies in Jitra, Natrah with her Ipoh's dental appointment and we usually visits our relatives in Puchong, paying bills and car loans (which took an honest the whole morning to have it settled) and cooking small feast for the weekly surau's after Yasin feast. Since these are physical and I have the worst stamina ever I might let myself lazying around after finishing the works. Yay unemployment! Mostly movies as I quickly get bored with tv shows. Although currently, I am rather swooning over Tom Hiddleston in The Night Manager and also am eagerly waiting for the second season of Stranger Things. I tried to watch some new TV shows but all bore me like Elementary, Lucifer, Riverdale and 13 Reasons Why. I am a movie kinda girl. I've been meaning to list all the movies I have watched but that's gonna take quite some time to actually remembers it all. Recently, I just finished rewatching Lord of The Ring trilogies as I didn't follow the plot closely when I watched it during high school. You know how these movies take ages - I roughly spend 12 hours to finish it. I am going to finally watch the third movies in The Hobbits trilogies. I was so sakit hati with the second one because it titled The Desolation of Smaug but Smaug screen time was at the end of the movie only and it was only for about 15 minutes. Arghhhhh. I guess that was all. I actually wrote in my notebook on the points I want to write but the book is downstairs and I am upstairs. I just gonna accept it wholeheartedly if I missed any point. omg, I FINALLY FINISHES THIS. Being busy can take us away from blogging for a while but I'm glad you're back! Really love this post. yup! it's been a while and god it feels good to be back. Wow your time was fully utilized after graduating while I was being unemployed for over 3 months after graduating all I did was sleeping and being lazy at home, lol. #1 I envy those who got to experience being a teacher. Teaching had been my forever dream job, I wanted to be a lecturer but still never got the chance to try my hand on teaching yet. Hopefully, one day. #6 Movies and TV shows are the best choice when we have free time. And always would be fun too. I forever would choose movies over reading teehee. 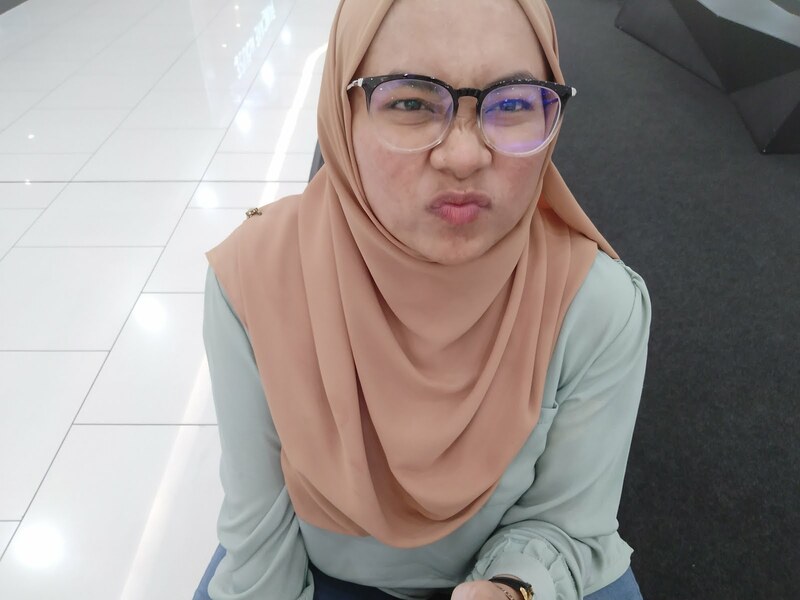 Hi Afifah ! Try Black Mirror. Issa series with different stories for each episode. I prefer that series sebab 1 episod like a mini movie to me. I'll be sure to try that. It sound exciting! Omg do wrote poems, we just make a group of malaysian poets on IG. If you ever make one, just find my account and DM me to be in. so much things to do, you really living your precious life, didnt you? i do feel i still have to do more but i'm settled for now. they lack passion. if you have the passion it is going to be one good day. me too dear, me too. awwwhh, these kind of comments and support that keep me writing. Thanks a million!